In November 2018, we had the privilege to visit our special friend Rob Handy and had the opportunity to enjoy the beauty of his creations on his kin’s domain. Rob is practicing the concept of “forest gardening” as the main agricultural method on his one-hectare plot. 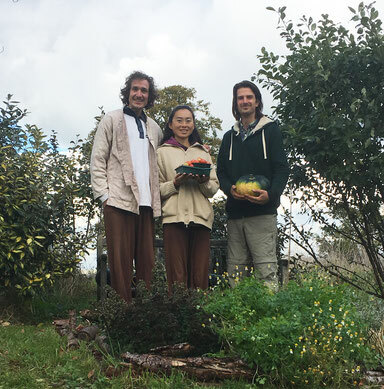 We were impressed to see that although it was the beginning of November, there was still an abundance of food growing on his land. During our visit, we could feel the love he is putting into his land and his creations. The term Forest garden is not really sufficient to describe what he is creating. Although a forest garden in itself is already an amazing concept, we felt what he is doing is more than that. We both felt a warm love emanating from Rob and his land. It indeed felt like he is turning his home into a real Space of Love, step by step. Rob´s homeland is located in East Harptree, Somerset, on the north slopes of the Mendip Hills. His ancestors from his mother’s side, have lived in the village for an impressive 600 years! Seven years ago he started to read Ringing Cedars book series, which inspired him to get some land and create a highly self-sufficient kin’s domain. Before these books, he was more into computer games and making films, overall, he was more indoor oriented. 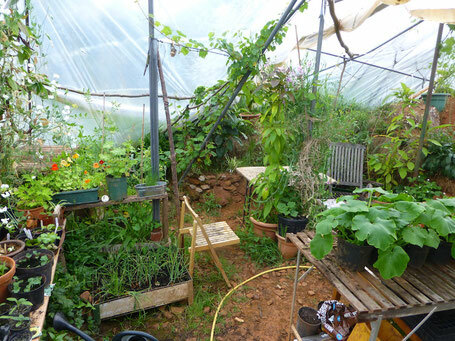 Now, he spends most of his time outdoors, either on his land, or sometimes also on other people´s land as a professional gardener, which has been his main source of income for the past several years. Along with Ringing Cedars series, Rob´s biggest inspiration to create a Forest Garden is from a book called “Creating a forest garden” by Martin Crawford. The land he is living on, was actually once his great grandparents’ land. For many decades however, it was owned by someone outside his family. Luckily, 7 years ago, he started to rent that very piece of land and 4 years ago, he was actually able to purchase it. His mum lives just beside him at the edge of the village. Also his 86 year old grandmother lives in the village, who, according to Rob, is a great gardener, who enjoys to care for and talk to her plants, is an active member of the community and still rides her bike regularly. 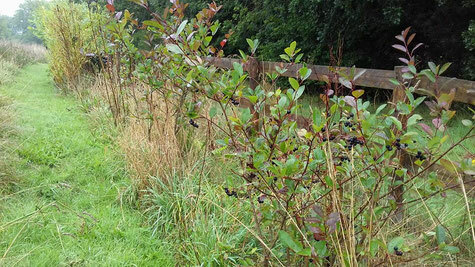 So far, Rob has already planted various nut and fruit trees, shrubs, medicinal plants, currant bushes and hedges. This winter, he will put 70 different types of perennial plants into his soil and prepare some ground for mushrooms. He also did some planting using Anastasia´s described method from the book. He said the taste was just as excellent as other vegetables he himself grew, he didn’t notice anything different, except that those plants would grow a lot faster, maybe due to the extra attention they received from him. After purchasing the land, he had virtually no money left, so all the buildings he constructed were essentially built by salvaged materials. “Skip diving” was one of the ways he got his building materials. He would just pick up some wood or some old windows from the big yellow container, which is supposed to be thrown away. Another source was his friend who owns a building company and gave him leftover “waste” building materials. 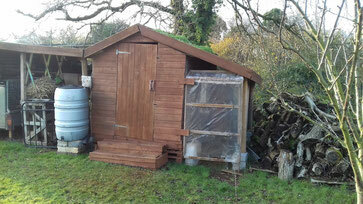 Bit by bit, he was able to build himself a greenhouse, a shed, a bathroom shed, etc. All were made from bits and pieces that he had found or being gifted. He just needed to buy some special parts, like his dry-composting toilet which is normally used on boats, or some connectors to fit certain pipes together. He now really knows how to cherish and appreciate his upcycled DIY-buildings. And all he spent for his constructions was only about 1000 pounds, plus 500 pounds for a solid caravan he renovated. 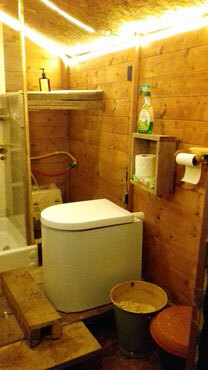 We found the wooden bathroom shed built from recycled materials modest, beautiful, clean and new. 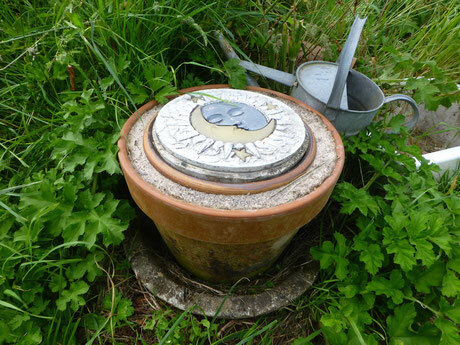 His dry-composting toilet separates urine from solid waste, which makes it pleasant to use and virtually odour free. And there’s hot water heated by gas! Compared to other off grid eco-friendly bathrooms we’ve seen which are often not so cozy, this is one of the best! 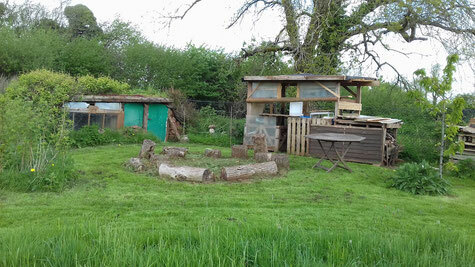 Rob intends to build a small straw bale house on his own in the near future, which will be his main dwelling. He thinks this will be permitted or tolerated, because his relationship to the people in the village is very good and they support him. It is worth mentioning that Rob, even if he would have had enough money, would have bought second hand materials wherever possible, for obvious environmental, economical and ethical reasons. On the other hand, buying rather than collecting, would have given him the advantage to get the exact materials he needed for what he wanted to build, rather than having to be creative and build with what he found. When it comes to throwing waste away, he is aiming for zero waste. He recycles, his food waste is composted and also his toilet waste is turned into black gold. 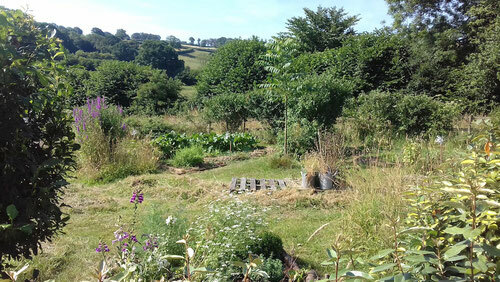 All that goes back to the land, enriching his forest garden. Rob is just in year four and he already needs to buy less and less, currently, about two-thirds of what he eats (based on monetary value) comes from the land. About his diet he feels it is difficult to put a label on. At home he is eating his own produce as naturally as possible, which makes him basically a raw vegan, but some things are better digested when cooked and he likes to cook for his girlfriend. He also does eat eggs from his mother´s chickens, because they are treated well and are given a good diet, otherwise he would not eat eggs. 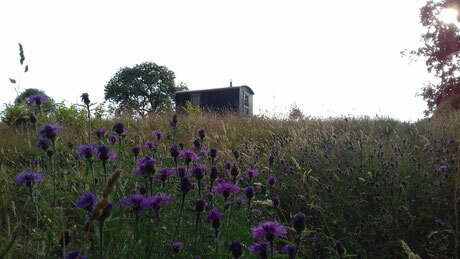 He has bees on site, but not for honey production but for their own sake and for pollination. Sometimes he takes a bit of honey from them, if the bees let him do that. 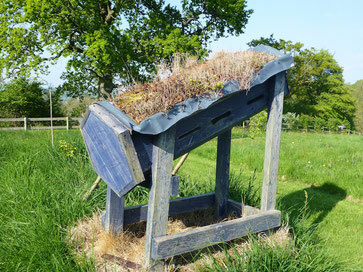 He doesn’t manage them in an intensive way, but takes an extensive approach, which also means that he does not feed them sugar syrup and only takes about 5 percent from each hive every other year, probably every third year. He uses that honey as a medicine rather than as a regular food. He has already been vegetarian for 20 years and also all of his family naturally became vegetarians. The reasons for his diet are moral, ethical, spiritual, religious, environmental, financial and for reasons of health, but he does not preach at all. When people ask him why he does not eat meat, he simply says “I do not need it, nor do I want it, there is too much else to eat!” Then they ask what else he eats and after he lists off 200 different things he eats they are surprised and go “ oh”. In fact he eats a much higher variety than normal meat eaters, who only eat about 7 or 8 different kinds of fruits and vegetables a week. Rob on the other hand eats around 15 or 16 different types a day! We were especially surprised to hear that he and his entire family do not use any salt. For him that just seemed so normal, that he was even surprised to hear that we and virtually everyone we know is using salt. His mother and grandmother do not even have salt in the kitchen. They never used salt and Rob naturally adopted to their salt free lifestyle. Whenever he would eat out at a restaurant or pub he would notice that the food was very salty. 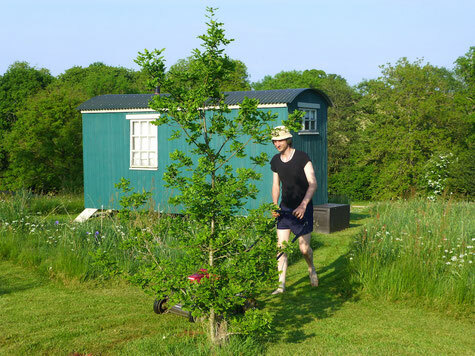 When talking to people about what he is doing, Rob generally uses the term forest garden or agroforestry, as these terms are more widely known and better understood. Forest gardening, just like permaculture, has a focus on companion planting, making use of symbiotic relationships between plants. 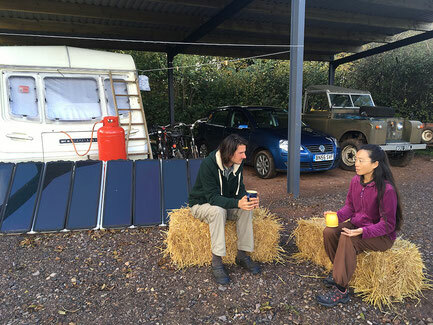 Rob says it can be really productive in terms of self-sufficiency. The system takes a long time to set up, but once it is established, it just takes a little bit of maintenance and it can run for generations, thus achieving one of the most efficient energy-input vs. energy-output ratio of any known agricultural system. 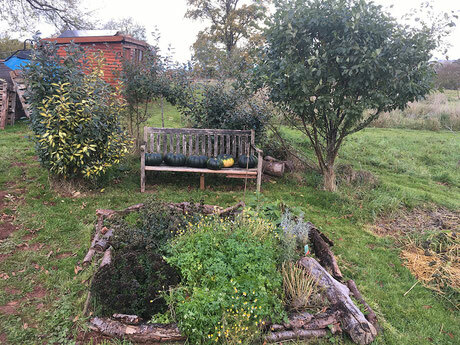 According to Rob, a one hectare forest garden in a temperate climate should be able to produce enough to feed 10 people all year round and also provide enough firewood, clothing materials and medicinal plants. 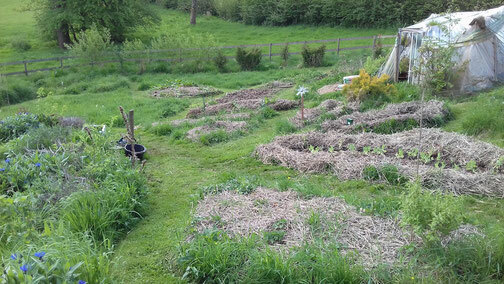 A forest garden will be drought and flood proof due to its abundant polyculture and extensive root system. There will also always be enough things to eat. Rob says that each and everyday of the year there will be at least 20 different things to harvest and eat from the land. One’s task is just to find these foods and collect them. There will be an abundance of shoots and leaves in the spring, fruits and berries in summer, nuts and mushrooms in autumn, and roots and legumes in wintertime. And even if 10 things would fail on one day, there would be still 10 other things to eat on that day. Rob actually did observe the land for about a year before starting to build or plant anything on it. For one year he worked on drafting a design for his kin´s domain, planning where he wanted to plant things or erect structures. 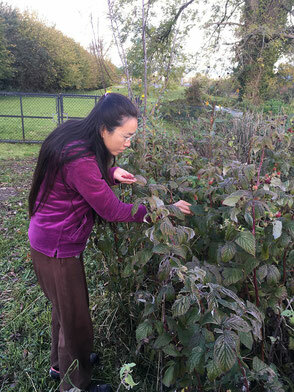 Obviously this was a good idea, as was shown by the fact that we were still able to harvest and eat an abundance of delicious raspberries at his land, although our visit already occurred at the beginning of November! Rob says that his land has lots of warm areas you would not expect, as well as colder microclimates, so called frost pockets where cold air sinks and is hanging for a long time. Honeybees like to choose the warmer places and prefer underground flowing water, he observed. Observing the land for a significant amount of time is indeed very important before one starts to put any buildings or plants on the land. However, Rob still has some things that he would do differently, if he could start all over again. He said, he would have planted some plants in a different location. Also, the root cellar is starting to break down because of his lack of craftsmanship, now he would rebuild it more durably. Especially however, Rob would now accept more of the help that was so generously offered to him, instead of using up his energy. Before he wanted to be stubbornly independent. He did not want to feel indebted to anyone, but now he’s realised these people really enjoy helping for the pleasure of it. He would definitely take more help from people who offered help, saving himself lots of time and energy. 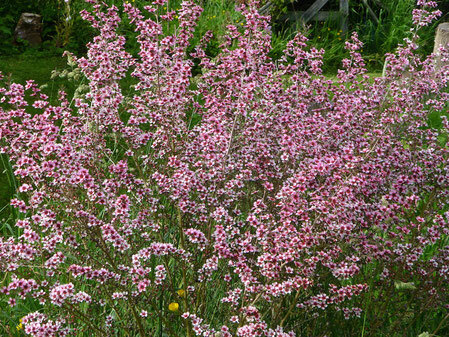 In that observation year, Rob also found a variety of wild plants coming up, including 22 different kinds of wild flowers. Thanks to his observation, he was able to retain all of the original diversity, because he only planted things in locations where there was nothing but grass. Now there are many more animals who come by for a visit. Among deer, the various creatures in the area have gotten to know Rob and are not bothered by him. Different kinds of birds, rodents, amphibians and insects come by for a visit or live on his land. There is already so much diversity and it is just going to increase. Many animals aren't afraid of Rob anymore a lot of the time. There was even a lovely old dog-fox who would visit him regularly and he has a barn owl who is keeping the mice population in balance. Unfortunately, hunters have killed a lot of the wildlife in the woods, including his lovely dog-fox friend. Rob told us about an amazing incident he experienced with a frog. 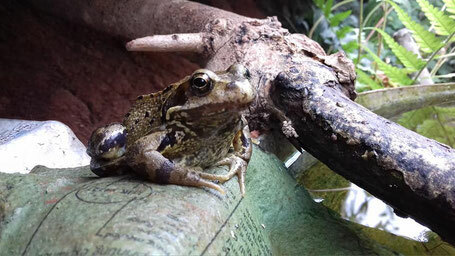 He has a good amount of frogs on his land, he even created several small ponds for them and they are helping him to balance the slug population. This summer, it happened that Rob was strimming the grass and he accidentally injured a frog. The frog was severely injured, his one eye and one leg were completely destroyed. Rob basically already wanted to end the frog’s life, because he was not sure if the frog would be able to recover from the heavy injury. But he changed his mind and decided to put the frog into the green house, where he came to see and caress the frog two or three times a day. After 1 to 2 weeks the frog completely healed itself, it was back to normal! Now it lives in the greenhouse and would come to greet Rob almost every time he would enter the green house. The frog has developed a loving relationship towards Rob. Rob says while the frog does not like to be touched too much, a little stroke now and then is fine for the little friend. Already 4 months have passed since that accident and the frog is still happily living in the greenhouse and greeting Rob. 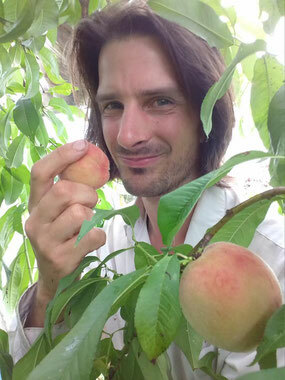 Rob would like to have animals in the future that fit into his forest garden ecosystem, like chickens who roam freely in the orchard section, scratching up the ground and eating fallen fruits, thus naturally controlling “pests”. He plans to have ducks, because they are even better slug eaters than frogs. And he wants to have geese to keep the grass paths low, because they eat only low grass. The idea is to only cut the grass paths once a year with the lawn mower or the scythe and then the geese will keep that low grass paths mowed naturally. Outside the main forest garden he has a wild flower meadow, which he maintains with scything and he also uses his mother´s ponies for meadow management. Rob has lived in the countryside almost all of his life. However, he tried to live in cities on several occasions. Rob says cities are a good place to make friends, because there are lots of nice people, but he simply could not handle the city lifestyle. He feels cities are just too unnatural, too noisy, too stinky and too dirty. After moving to his land, he had a lot of changes, everything became different. His outlook on life changed and he became happier and healthier. He had much more energy and he had a clear direction in life, knowing what he is doing. Since having the land, Rob basically does not travel to far off places anymore. He would not even have the time for it, nor the interest. He says he feels excited everyday after waking up on the land and if he stays anywhere else, he is looking forward to get back to his land. This has been going on already for 7 years since he first had his land. Surely a state of happiness, that most people can only dream about! How many modern people nowadays wake up feeling excited and cannot wait to start the day? We’re very happy for Rob that he has succeeded in creating a happy life in this challenging era. However, he does not always look forward to going out to work for other people as a professional gardener, e.g. on a hot summer day or cold winter day he does not feel fully motivated to go out and leave his land. In the coming years he wants to start running courses on his land and gradually reduce the amount of time he needs to spend working elsewhere. Off grid clay pot "fridge"
Rob´s life mission is to teach as many people as possible about what he is doing, and encourage them to do it as well. He says: “I will do a lot for free and share a lot of my knowledge and discoveries via my Channel ‘Rob´s discovery’, but I will charge money for in-depth courses I will hold, e.g. about natural beekeeping or on how to create a forest garden.” He will also teach about permaculture and a variety of things like, how to make essential oils or how to create beeswax candles. He is aiming for needing a lot less money, which is possible through higher self-sufficiency and conscious consumption. To teach what he knows, that is his gift and purpose. He already has a list of people in the village on his waiting list who want to learn from him. Also I am one of those who are looking forward to participating in one of his workshops and learning from his experiences. We told Rob that there are many people who want to live like him, but they have a lot of worries, they have to give up many things to change their life dramatically, so they are waiting for something and somehow they don't move. We asked him if he has any words of recommendation or encouragement for these people. 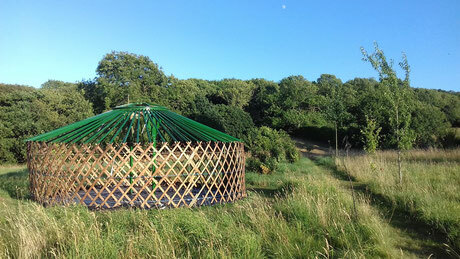 We would like to thank Rob for welcoming us to his Space of Love Forest Garden. We feel honoured to know someone like him, he is a true inspiration to us!